Microgaming powered Spin Palace Online Casino is pleased to reveal that a lucky punter won a massive amount of €3,904,000 wagering on the Basketball Star video slot game on Friday, 26th October 2018. The huge amount won by the player, known only as Katsumoto, is more than what many progressive jackpots pay out. The 5 reel and 243 ways to win basketball themed Basketball Star video slot game can be played from between 50p and £50 per spin across desktop, mobile and tablet devices. 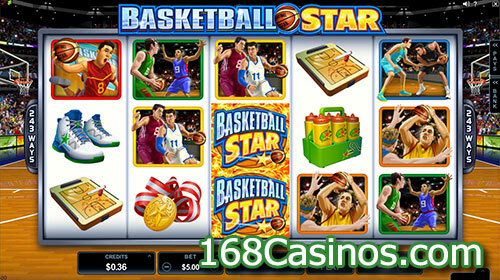 The action in the Basketball Star video slot game takes place against the backdrop of a basketball arena, complete with cheering crowds, making the game of basketball come alive on the screen. The high paying symbols are basketball players executing various moves while the low paying symbols are sneakers, gold medals, a basketball court and an energy drink. The Wild symbol is the game logo that appears stacked on reels 3, 4 and 5. The Scatter symbol is the basketball that awards payouts that are multiplied by the total bet. The video slot also includes the Rolling Reels feature. Landing three or more Basketball symbols scattered on the reels will trigger the Free Spins Bonus where players are awarded up to 25 Free Spins. The Rolling Reels come with increasing multipliers in this feature. Consecutive wins in the same spin are paid out with multipliers in the sequence 1x, 2x, 3x, 4x and 10x. Spin Palace Online Casino is powered by Microgaming and is licensed and regulated by the Malta Gaming Authority.